Here we are, thousands of us, in the city that’s known to the world as the Gateway to the West. But this weekend we know it as the Gateway to the Best – the best high school newspapers, yearbooks, magazines, television, radio and online media in the country as well as the best student staffs and faculty advisers. We’re here at the gateway looking for what will make us even better. With more than 300 breakout sessions, two award-winning keynote speakers, the International Pictures of the Year exhibit, a trade show featuring nearly 40 exhibitors and students from hundreds of schools, we’re bound to find something that will make us better journalists. And while we’re looking, we’re likely to find opportunities to make us better people too. 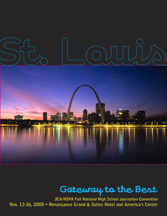 Consider the Gateway Arch. At 630 feet it is the tallest national monument in the United States and every year since it opened in 1965 its tram has carried more than a million visitors to the top. The amazing 17,246-ton structure is as important for its symbolism of Thomas Jefferson’s expansion of the west as it is for its breathtaking structure. The courage and curiosity of Jefferson and Lewis and Clark to discover new horizons are attributes of good journalists who explore events and tell the stories the readers need to know. The vision of the architects to create the Gateway Arch commemorates the discovery of thewest and helps preserve the story of the explorers for all time. Telling stories is our business too. We report the agony of the benched football player and the joy of the volleyball team as they take State. We tell the story of the teen parent, the merit scholar, the presidential candidate and how economic uncertainty has affected the lives of our audiences. We tell stories and we make a difference by giving students their own voice. Here at the Gateway, we hope you’ll find what you need to become an even better student journalist.